Many thanks to SWLing Post contributor, Paul McDonough, who notes that CountyComm has posted a 48 hour sale on the GP5-SSB (click here to read our review). The price is $71.99 US. Click here to view on the CountyComm website. This entry was posted in Deals, News, Shortwave Radio and tagged CountyComm, CountyComm GP5/SSB, Deals, GP5/SSB, Paul McDonough, Radio Deals on December 13, 2017 by Thomas. Many thanks to SWLing Post contributor, Paul Walker, who notes that CountyComm has announced a 48 hour sale on the GP5-SSB (read our review here). The price is currently $71.99 US plus shipping. Click here to view the deal at CountyComm. This entry was posted in Deals, News, Shortwave Radio and tagged CountyComm, CountyComm GP5-SSB, CountyComm GP5/SSB, GP5/SSB, Paul Walker on August 16, 2017 by Thomas. After our post this morning regarding the high-gain ferrite bar antenna (available via eBay), I received a message from Nick at CountyComm. Many thanks, Nick, for the feedback. 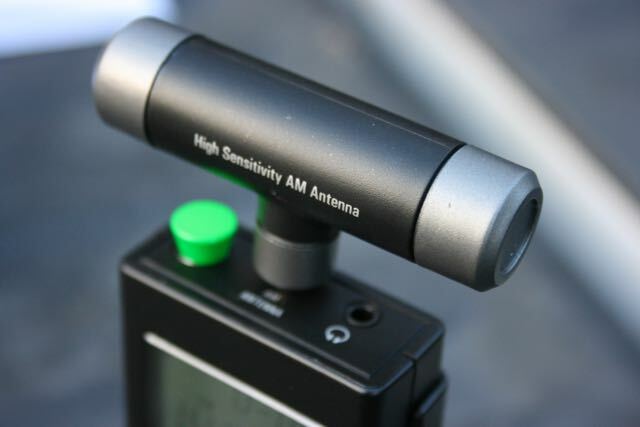 It is important to note that the high-gain bar antenna is not an OEM product, so CountyComm isn’t responsible if it harms the radio’s antenna jack. While still relatively lightweight, the high-gain bar antenna is substantially heavier and longer than the GP5’s supplied MW antenna. I’ve been concerned about dropping the GP5/SSB with the larger bar antenna inserted–fearing the jack could break off–so I’ve been very careful using it. I’ll probably continue using the larger ferrite bar, understanding that I’ll have to handle it with care. If you’re concerned about damaging your radio, I would suggest using an inductively coupled AN200 loop antenna instead. Again, Nick, thanks for the heads-up! This entry was posted in AM, Antennas, Mediumwave, News, Radios and tagged AM, CountyComm, CountyComm GP5-SSB, CountyComm GP5/SSB, ferrite antennas, FM, GP5-SSB, GP5/SSB, Mediumwave, shortwave on May 5, 2016 by Thomas. I hope this finds you and yours well. I just wanted to take a few moments and express my sincere thanks to you for your posts of 12/20/2014 and 1/6/2016, and for sharing Larry Thompson’s post of 2/28/2016, and Ron’s post of 1/16/2016. If you are in regular contact with the other individuals please feel free to pass along my thanks as each of you and the respective post convinced me to purchase a CountyComm GP5/SSB and Ebay seller playloudfm’s high-gain ferrite bar antenna. I am so glad I did, so a hearty Thank You to each of you. The afternoon of March 19th local was the first chance I had to use my GP-5/SSB. After popping in three fresh AA’s on AM using the internal ferrite bar antenna Beaumont, Texas’ own powerhouse 5,000 watt KLVI 560 was there as was 1,000 watt Orange’s KOGT 1600, 23 miles away and my AM daytime benchmark 50 kW KTRH 740 Houston 70 or so miles away on the back side of their pattern. KTRH surprisingly can be a little difficult during the day due to noise. The surprise was 50 kW WWL New Orleans 240 miles away was intelligible above the background noise. Extending the whip a quickie SW test showed WWV Fort Collins time signal was present at 15 MHz. On the AM side the real money lay after dark once the sun had set in Beaumont and San Antonio. Using only the internal ferrite bar antenna all of the aforementioned AM stations were present. Continuing the internal antenna’s test 50 kW WBAP 820 Dallas 244 miles away and 50kW WOAI 1200 San Antonio 266 miles away were present. I started grinning when 50 kW WLAC 1510 Nashville 598 miles away and 50kW KMOX 1120 St. Louis 632 miles away were just intelligible above the background noise. Keep in mind these stations were received using only the internal antenna. I popped the CountyComm included factory external ferrite bar on and used it 9 -10 PM Saturday local, 0200 – 0300 March 20 UTC. Using the external antenna rotated for best reception WLAC and KMOX improved to the point they were easily listenable. 50 kW WSB 750 Atlanta 625 miles away was listenable above the noise and most surprising 50kW WBBM 780 Chicago 892 miles away(!!!) was just intelligible above the background noise. Another quickie SW test was performed at 10 PM local, 0300 March 20 Sunday UTC by extending the built in whip and the WWV Fort Collins time signals were present at 5 and 10 MHz with 10MHz being particularly well received. A real treat lay in store after receiving Ebay seller playloudfm’s aftermarket high-gain ferrite bar antenna, the subject of your 1/6/2016 and Ron’s 1/16/2016 post, yesterday. I am not experienced enough to judge what the space weather or propagation conditions were like from 0300 to 0400 March 27th UTC but I was extremely surprised and pleased with the reception results the new antenna afforded. As I sat relaxing in my easy chair before bed I decided to try the combo out using the included earphones so as to not wake my wife. With the lights off and my iPad open to www.oldradio.com/archives/stations/ccs.htm to help identify clear channel stations I took the handheld combo for a spin. All of the stations found with the factory supplied external ferrite bar antenna were present. There was just so much more signal present using the aftermarket antenna each became easily listenable. For WOAI, WWL, WLAC and KMOX the effect was as if I was located within their local night coverage area. 50 kW WHAS Louisville Kentucky 740 miles away was newly found present. Chicago’s WBBM was there as before and I was surprised to find 50 kW WGN 720 Chicago as well. The reception quality was such that one could enjoy listening to a Cub’s game or breaking local news story should one be so inclined on WBBM or WGN. The listening experience was similar for newly found 50 kW XEROK 800 Ciudad Juarez 738 miles away. The most surprising and gratifying, to me anyway, find of the night using playloudfm’s antenna was receiving 5,000 watt (nights!) KCMO 710 Kansas City Missouri 624 miles away. The ability to rotate the antenna to take advantage of it’s directional and nulling ability really aided in this reception. It really is a great benefit to be able to rotate the GP-5/SSB’s external AM antennas for peak signal strength while nulling interfering signals and noise. Indeed KCMO was missing in one antenna orientation but rotating the antenna 90 degrees and the station popped in. I really should have jotted signal strength to noise ratios down but I was just enjoying tuning through the spectrum too much. I have not fully tested SSB Exalted Carrier tuning on the GP5/SSB of difficult stations but have tried it 3 or 4 times and it does appear to work as does tuning 1 kHZ either side of the nominal frequency. The later technique did help clean up some signals by further reducing background noise without greatly affecting listenability. Note: all distances listed above are “as the crow flies”, straight line city center to city center and are not necessarily correct for the transmission tower location. This little radio is fast becoming a hand holdable favorite with easy to learn button placement for use in the dark. I am all ready beginning to prefer it to my Sony SW7600GR / AN200 loop combo for MW broadcast AM reception but I really must do more work with SW before calling the CountyComm my favorite of the two. I finally got the opportunity to test the FM performance of the radio using only the extended whip on the afternoon of April 1st, April 1st 19:30 – 21:00 UTC. Using www.radio-locator.com and my zip code I found 51 FM stations listed as local, distant and possible fringe reception. I was very surprised and pleased when I was able to log all of the most distant fringe stations, KUHF, KKBQ, KTBZ, KKHH, KHMX, KBXX, KODA, KILT, KLOL, KMJQ, KRBE, KOVE, and KGLK, with ERP’s listed as 90 to 100 kW and distances in the given in the 80 to 90 mile range. In short I was able to log all 51 listed stations. The FM broadcast band is crowded indeed with this little rocket radio. It should be noted my little corner of Southeast Texas is dead flat with nothing between me and these stations broadcast towers but Houston skyscrapers, the typical urban / suburban sprawl, timber and marsh. Ground elevations range from 16 ft to 80 ft above sea level between me and many of the broadcast towers. […]My Sony SW7600GR / AN200 loop / Sony AN-LP1 loop combination sits in it’s go bag rapidly falling into disfavor, replaced by the easily used in the dark one handed CountyComm GP-5/SSB. Again thank you for your kind response and thanks again to all who motivated me to purchase this rig. Steven, thank you so much for taking the time to share your experience with the GP5-SSB and the high-gain ferrite bar antenna. 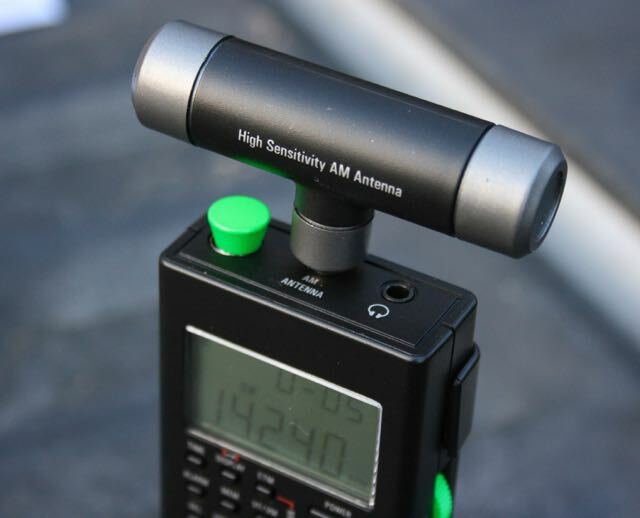 I also have the high-gain ferrite bar antenna and have been meaning to post videos showing how it performs compared with the supplied GP5 antenna. I must say, it does do a pretty amazing job. I’ll get some videos posted in the coming weeks! This entry was posted in Accessories, AM, FM, Guest Posts, Mediumwave, News, Radios, Shortwave Radio, Shortwave Radio Reviews and tagged AM, CountyComm, CountyComm GP5-SSB, CountyComm GP5/SSB, ferrite antennas, FM, GP5-SSB, GP5/SSB, Mediumwave, shortwave, Steven Crawford on May 5, 2016 by Thomas. 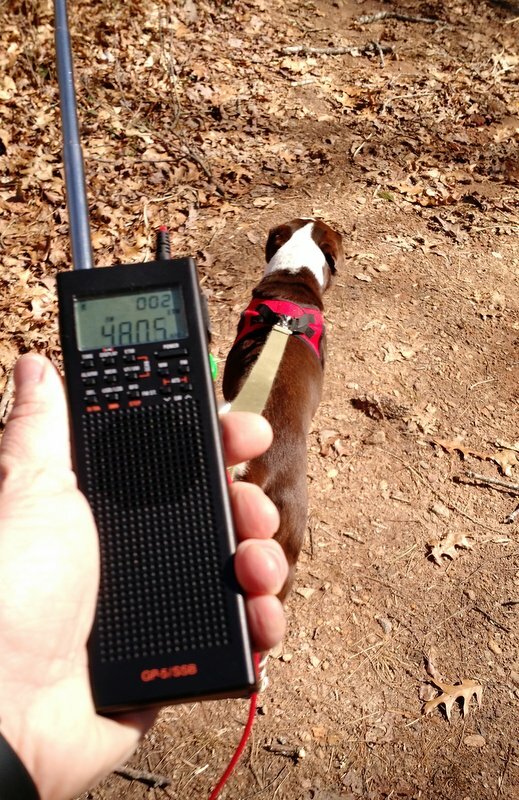 My two hiking companions: the CountyComm GP5/SSB and Hazel the dog. 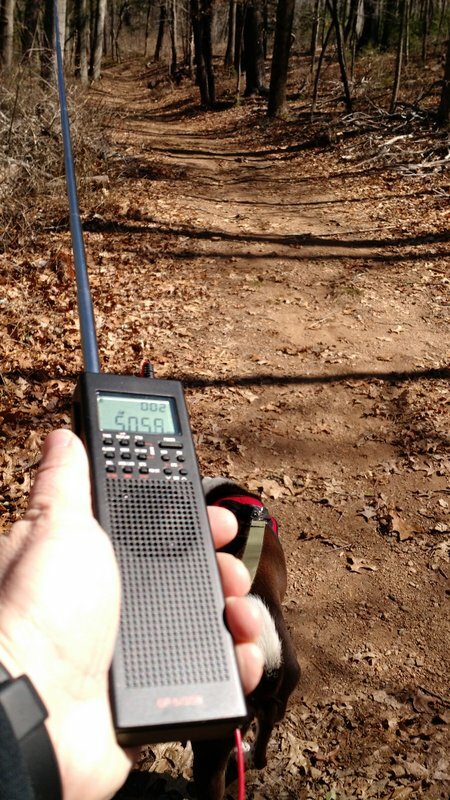 Posting the Blinq deal a few moments ago reminded me that my favorite shortwave radio to use while hiking/walking is the CountyComm GP5/SSB. I have CountyComm’s custom GP5 case which I clip to my belt or backpack. 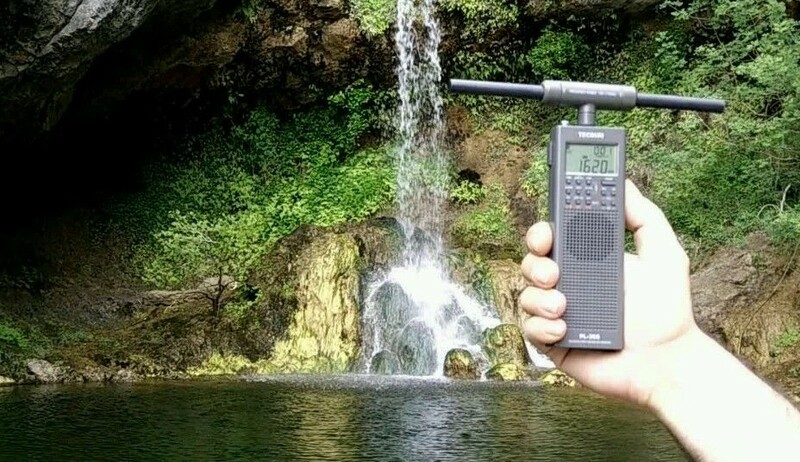 While hiking, I find it handy to open the case from the top, pull the radio out and operate/tune it with only one hand. Indeed, the vertical form factor of the GP5/SSB is ergonomically-ideal; I can control almost all of the radio functions without having to use two hands. A huge bonus while hiking on uneven terrain! Typically, when I start a hike, I enable an EMT scan and within a minute or so, the GP5/SSB populates temporary memory positions with all of the signals it can easily receive. When you’re in the middle of the woods–far from sources of radio interference–you’ll be amazed by what you can hear. Of course, with the antenna fully extended, one does have to watch out for low-hanging branches, etc. Since the telescoping antenna doesn’t swivel, it’s much easier to hold the radio in a way that the antenna points forward while you hike (bonus: it’ll catch all of the spider webs across the trail before your face does!). 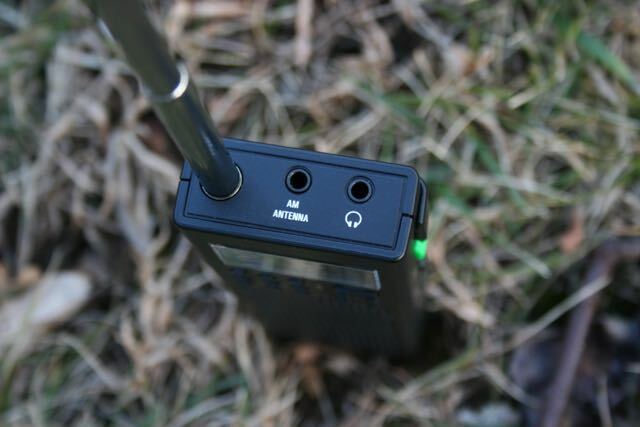 So far, I’ve never used the external mediumwave ferrite bar antenna while hiking–I worry that I could drop the radio and damage either the antenna or the 1/8″ antenna jack. I typically listen to the GP5 with headphones unless I’m walking a trail during the time of year when black bears are active (in which case the speaker helps alert bears that I’m in the neighborhood). If you’re not familiar with the CountyComm GP5/SSB, click here to read previous posts. I also featured the CountyComm GP5/DSP (Tecsun PL-360) in an ultra portable shoot out in 2014–click here to read. 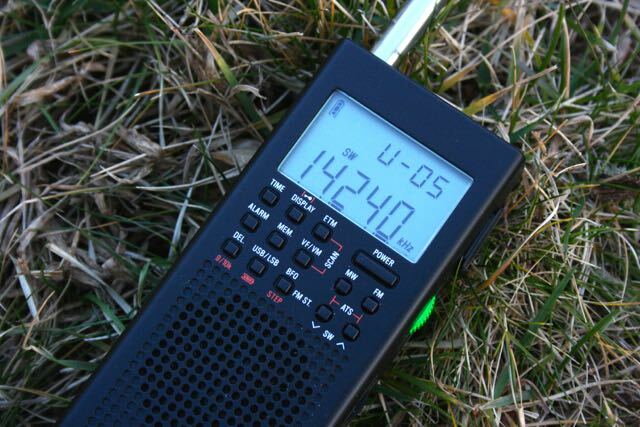 Do you have a favorite shortwave portable for hiking, biking or cycling? Please comment! 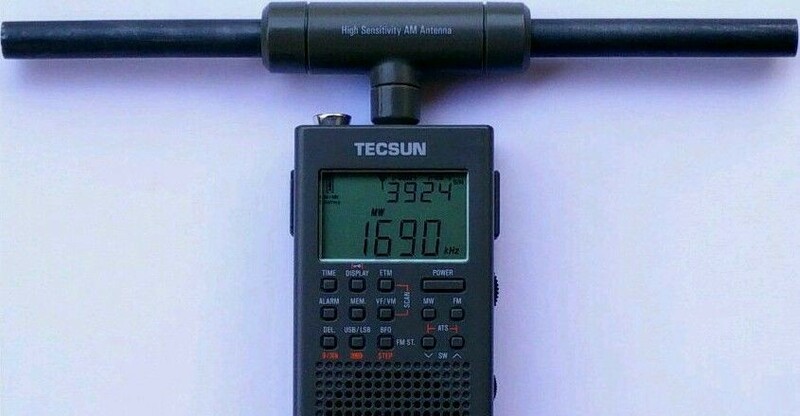 This entry was posted in News, Portable Radio, Radios, Shortwave Radio, Shortwave Radio Reviews, Sports, Travel, Ultralight DX and tagged CountyComm, CountyComm GP5/SSB, CountyComm GP5/SSB review, GP5/DSP, GP5/SSB, Hiking Radio, Shortwave Hiking, Tecsun, Tecsun PL-360, Tecsun PL-365 on March 30, 2016 by Thomas.